I currently have built a 4' 6'' model of this vessel and finished a rebuild of her after damage when it fell off ,with the roof rack, from my motor car some years ago. I built ferocity from vosper drawings and hull lines obtained from Uffa Fox's book Seaman like sense in powercraft. I have a number of photos of her plus photos of my 6' Brave Swordsman, and of a 4' 3' Model of Dark Gladiator. All my boats are radio controlled. I plan to make a 5' model of Brave Swordsman shortly as i was fortunate to obtain general arrangement drawings[ In various roles] from Vospers I welcome Correspondence from interested parties in fast patrol craft. Regards Mike harrison. Let's see the photos then! mikeandwendy@snap.net.nz If you do send me your Email address ,It will remain confidential. 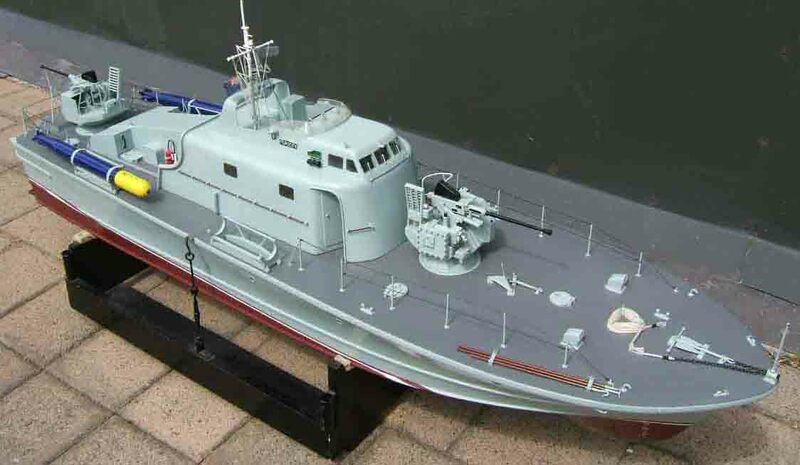 I enjoyed your photos on your website, and was quite suprised at how many Patrol type craft have been converted to pleasure craft. I will also give you a breakdown description of each photo. Regards, Mike Harrison. hi mike i wonder if you could help me? i picked up a sad and tatty looking model boat last week and i am trying to find out what type of boat it is. after scouring the net i thought i it was a ferocity. but after looking at your pics i dont think it is. the upper super structure is pretty much the same but i have a lovely sleek funnel behind the fly bridge. can you help please i want it to have a correct ref number. 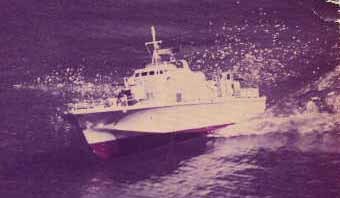 Here is a poor image of one of several Vosper craft exported to Malaysia. This boat was one of 14 known as the 'Kris' class named 'Kelewang'. There were several other boats of similar appearance (4 'Sabah' class and 6 'Kedan' class). I do have the complete list of Pennant Numbers if you so wish - drop me a PM and I'll forward them on. Hi PPUX, The photo of The Kelewang is the similar craft that I was refering to in my last message. You guys are stars !!! where did you source the stunning deck ordanance for your fleet mike?